THIS IS A PROP215,SB420 COMPLIANT,+18 , PATIENT ONLY EVENT MUST HAVE ORIGINAL RECOMMENDATION AND CA ID. 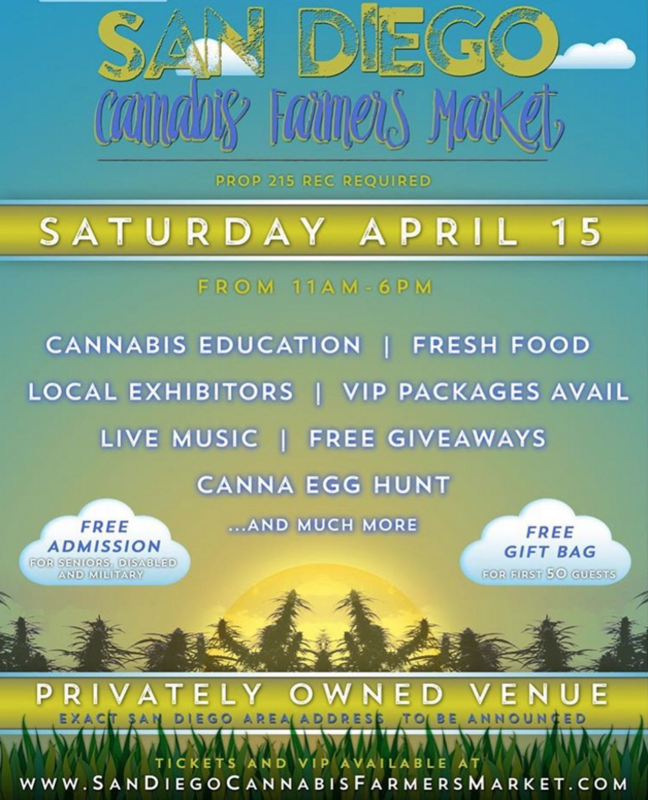 LOCATION IS A PRIVATE OWNED VENUE AND THE LOCATION IS TBA PLEASE SEND YOUR REC AND ID TO OUR EMAIL TO GET LOCATION We noticed a need for safe access and cannabis education for patients in San Diego, so we are hosting the San Diego Cannabis Farmers Market to connect the patient with the right MMJ companies for there needs. We will have a variety of different options for our patients 25+ exhibitors that specialize in every aspect of Cannabis education.